Ali Davis (Taraji P. Henson) is a successful sports agent who’s constantly boxed out by her male colleagues. When Ali is passed up for a well-deserved promotion, she questions what else she needs to do to succeed in a man’s world… until she gains the ability to hear men’s thoughts! With her newfound, Ali looks to outsmart her colleagues as she races to sign the next basketball superstar, but the lengths she has to go to will put her relationship with her best friends and a potential new love interest (Aldis Hodge) to the test. WHAT MEN WANT is the latest comedy from director Adam Shankman (HAIRSPRAY) and producers Will Packer and James Lopez (GIRLS TRIP), co-starring Tracy Morgan, Richard Roundtree, Wendi McLendon-Covey, Josh Brener, Tamala Jones, Phoebe Robinson, Max Greenfield, Jason Jones, Brian Bosworth, Chris Witaske and Erykah Badu. 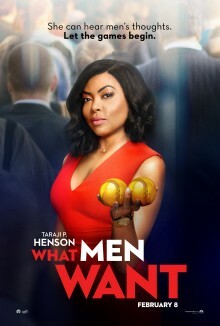 WHAT MEN WANT is a hilarious new take on a classic romantic comedy, updated for a new generation. While our core target demographic is African American women, it has the potential for broad female and male appeal – think of it as a date night movie that’ll be popular with everyone. Add to that the popularity of Taraji P. Henson, a strong comedic supporting cast, great sports cameos, and the caliber of film promised by Producer Will Packer, and there’s something to offer for everyone. Join LatinoScoop at an exclusive advance screening of WHAT MEN WANT in select locations below. Click on the city name below for your city and enter the code. If you download a screening pass and aren’t able to use it, please share it with someone who can attend. There is a limited number of passes available for each location. Screening passes are available on a first-come, first-serve basis. Additional passes will not be added once they are all redeemed. Anyone downloading a screening pass is advised to arrive early to secure seating. The theater is intentionally overbooked by the studio to ensure a full house. Plan accordingly to arrive at the theater with enough time.